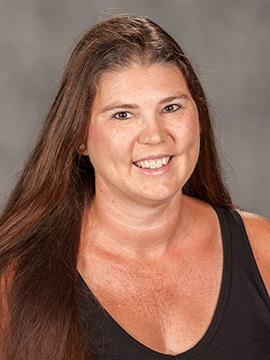 I teach at Hesston because I am passionate about sharing basic nutritional principles while introducing and furthering understanding of a normal relationship with food. What draws you to the field of nutrition? As a child my mother changed our dietary intake due to a medical issue. After eating differently, the medical problem resolved. Because of our diet changes we experienced both positive improvements (my mother’s health) and negative effects (the introduction of disordered eating behaviors leading to a less than normal relationship with food). As a Registered Dietitian I have studied both the effects of nutrient intake from foods and the impact of deprivation upon a person’s food choices and overall health. It is the latter that I find most interesting to study and helpful to share with others. However, I enjoy science and I find sharing the basics of nutrition education enjoyable as well. Through teaching Principles of Nutrition I get to focus on sharing both aspects of this discipline with students. Generally, the U.S. culture is confused about nutrition and afraid of weight gain when eating foods they truly enjoy. Advertisers promote seemingly contrary aspects of food (ranging from diets and deprivation to tasty, enjoyable foods people feel guilty about eating). I enjoy discussing these concepts and leading students into the acceptance of all foods as appropriate for “healthy” intake. Discussing the science-based results of deprivation that most in the U.S. are yet unaware of gives me an energy like no other topic. I enjoy expanding students’ understanding of normal eating and a healthy relationship with food. In my dietetic internship I gained experience in the world of nutrition and developed into an anti-diet dietitian for whom joy in eating is primary, and normal eating is freedom. Due to my education in dietetics I respect the science of nutrition and the food choices we make. Both of these factors come through strongly in my teaching and in the coursework that I assign.